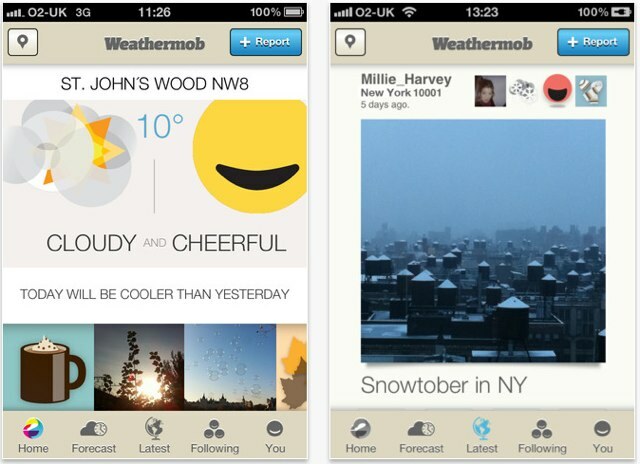 Weathermob is new and hip on the App Store this week. It’s a weather app with a twist – it’s social. Think of it as Instagram for clouds. Kinda. Like other sharing networks, you have to sign up to use Weathermob, but that’s free and only takes a moment. You can import your avatar from Twitter, and also seek out Twitter and Facebook contacts inside Weathermob. In no time, you’ll have a cosy network of familiar faces to follow and be followed by. But what will you be doing on Weathermob? Reporting the weather, of course. The idea is that you submit periodic reports of what the sky is doing near you, along with a bunch of miscellaneous metadata too. What sort of metadata? Your mood. A photo of the weather, or what you’re eating, or your pet snake. Whatever. You can add video and words too, if you like. It’s flexible. Everyone’s reports appear in a timeline, which you can browse and do the things you’d expect to be able to do: comment, follow, like, and so on. Tucked away inside all the social stuff is quite a nice weather forecast feature too, showing you a lovely clear overview of the next few days, including the likelihood of rainfall. Overall it’s a cool little app, and should go down a storm (ahem) here in the UK, where as you probably know, we never talk about anything else.